Castello Cheese is an historical cheese brand that started since 1893 and they create more than 40 different types of delicious cheeses. I’ve recently been selected to be one of Castello’s collaborators to come up with a unique recipe with their jalapeño havarti cheese that’s more than just a grilled cheese sandwich or cheese dip. 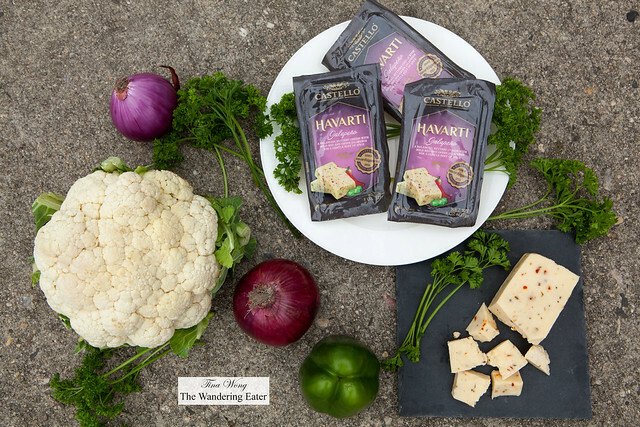 Havarti cheese is a Danish-style cow’s milk cheese that is a mild, semi-soft and creamy but mine’s has the addition of jalapeño to give it a spicy kick. After some navel gazing and whittling down the list, I came up with the jalapeño havarti cheese and cauliflower crustless quiche. It’s an adaptation from Yotam Ottolenghi’s cauliflower cake from his recent book, “Plenty More.” I’ve chosen this recipe since most of us Americans have been for the past year, been swooning over the exotic spices and vibrant flavors of Middle Eastern food that Mr. Ottolenghi introduced to us. I wouldn’t necessarily call this concoction a cake, as I think it’s a huge quiche without any crust, save for the black sesame seeds that line the pan. I thought of taking the page of robust flavors of this quiche and incorporating the creamy, slightly spicy havarti to make it creamier and have some heat and reduced the olive oil a bit since the addition to the creamy havarti. 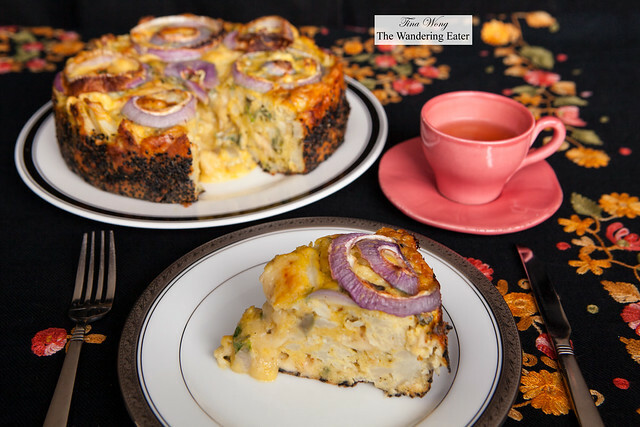 This quiche is flavorful and densely loaded with vegetables and cheese that it will certainly be a meal in itself, just serve it with a side salad and you’re all set. While the cauliflower is cooling, prepare the batter. Halve the red onion and cut a few thin rings off the end of one side; set them aside. Coarsely chop the remainder of your onion. Heat all of the olive oil in a saucepan and saute the chopped red onion and rosemary together until soft, about 8 minutes. Remove from heat and allow to cool. Whisk eggs and olive oil and onion mixture together. Whisk flour, baking powder, turmeric, cheese, salt and black pepper together in a separate bowl and add to egg mixture, whisking to remove lumps. Stir in cauliflower gently, so most pieces remain intact. Line the bottom of a 9-inch (24 cm) round springform pan with parchment paper. Butter the sides generously. Put the sesame seeds in the pan and toss them around so that they stick to the sides. 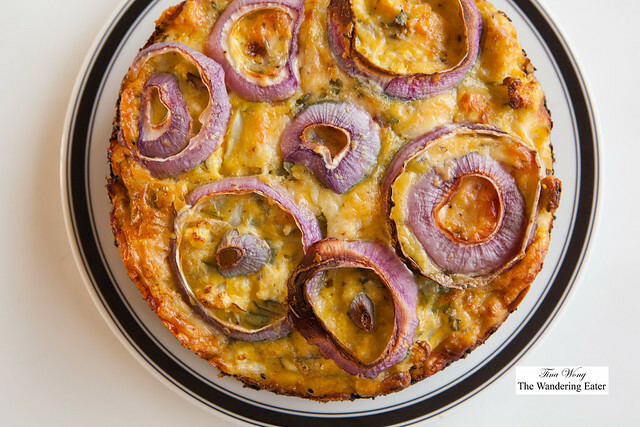 Pour in the cauliflower batter, arrange the reserved onion rings on top and bake cake in the center of the oven for 50 minutes, until golden brown and set. Serve warm or at room temperature. Before you serve the cake, be sure to run a knife around the pan.